A whole 40kg tuna getting filleted and served up as fresh sashimi and hand rolls? This ain't Tsukiji Fish Markets baby, this is in a Sydney food court! 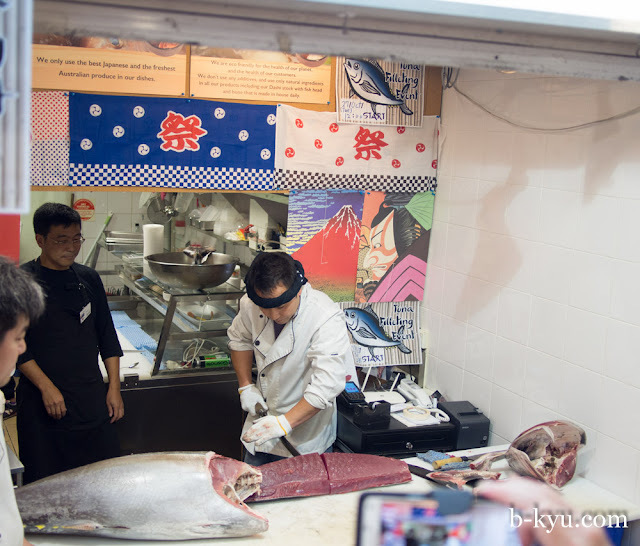 Hunter Connection in Wynyard is the most unlikely place to find a whole tuna being filleted for your lunch time pleasure. 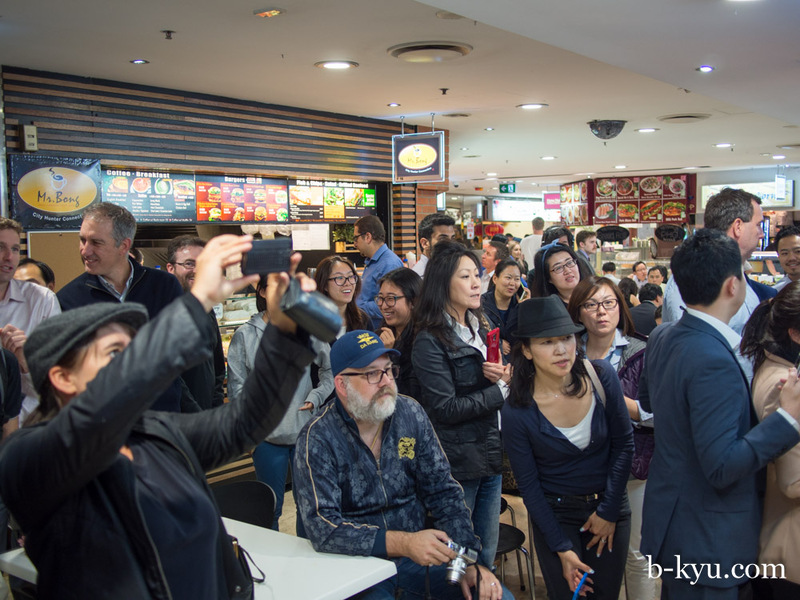 But once a month the normally regular sushi stall Sashimi Tucker gets a whole whopping blue fin and fillets it in front of the punters. This is something normally done as a special presentation, or behind the counter, so to see where your tuna comes from is really something special. By the time we've arrived the head is all that's left, sitting in a little pot on the counter. The rest has been sliced up and is served up as a don, salads, a handroll or in wraps. On the tray on the front counter you can see the tuna sliced into it's many pinkish hues, each piece a little fattier and different to the others. The tuna menu du jour. Starts at midday and ends when they run out. 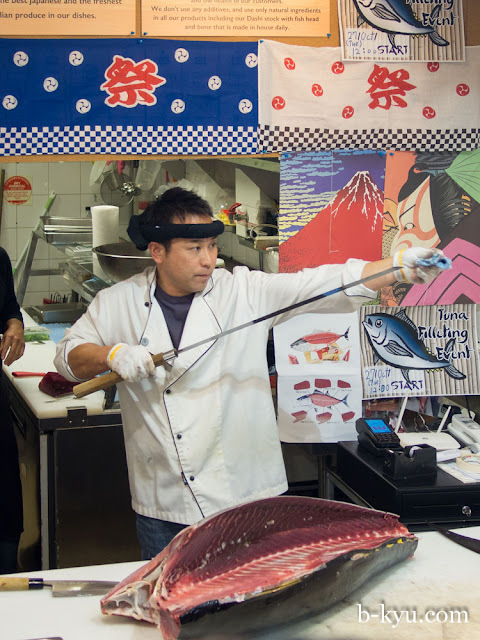 At the very front is the tuna master, slicing away at the pieces of filleted fish. He picks out some choice pieces from a selection and slices them for each individual bowl. Tuna Zuke Rice Bowl $11. The tuna at the bottom of this bowl has had a light bath in soy sauce to give it a little more salty flavour, while the tuna pieces at the top are finely diced almost to a mash and still raw. Making the Tekka Roll, layers of rice then a generous serve of darker tuna meat. Hand Roll, $4. Opening the plastic container unleashed a large whiff of nori, a wonderful hit of sea scent. 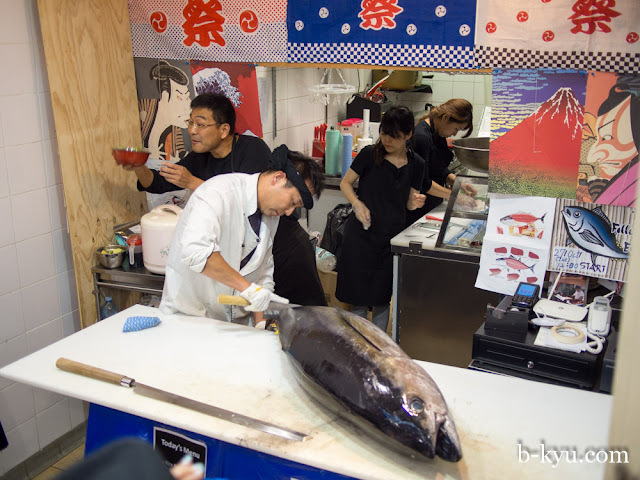 The roll was filled with tuna and wrapped in a cone shape as a hand roll should be done. Tekka Roll, $3. This is a more common sushi type roll, made as one big piece (demonstrated above) and then sliced to show the fillings inside. Delicious! 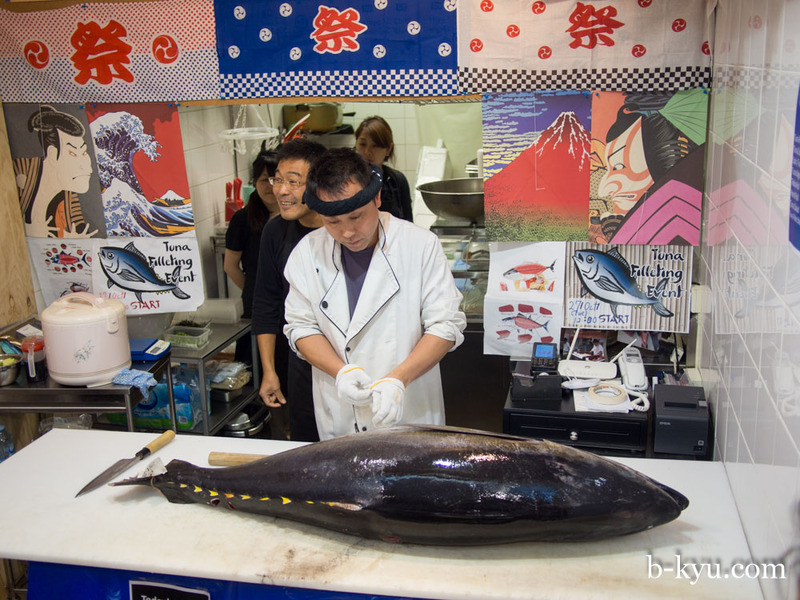 There was no wasabi or soy added to the fish, just pure tuna. Mr Shawn arrives early for the 12pm fishy carving, so do a whole bunch of other folks. It takes a while for the show to start and the crowd gets a little niggly. Mr Shawn was standing there waiting when some cranky lady has a go it him for pushing in line. When in fact there is no line. To order, look out for a lady or dude with a notepad, order before the show starts to get at the top of the line. It's wise to keep tabs on who has ordered before and after you because the staff don't write down your name or give you a number, and they can get confused. The wait is worth it though. The knife guy puts on a good performance and gives quite an interesting talk, get to the front so you can hear him. The is the tuna rice bowl, super fresh though plain, next time Mr Shawn will go for the tuna zuke bowl, which has a bit of soy for added kick. Sashimi Tucker is at Shop 7-13 Hunter St, F12B Hunter Connection food court. They are open Monday - Friday 11.30am - 2.00pm. They only advertise the event on the Yachiyo Facebook page, so like them to find out when this is next on. 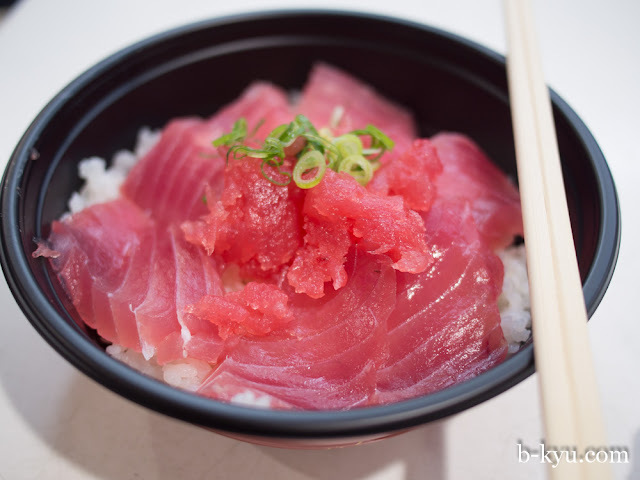 Sashimi Tucker is an offshoot of the Neutral Bay and Darlinghurst Yachiyo stores. OMG!!! Is that the old Sushi Nagashima stall? AMAZING! It's one of the stalls right next to where it was. The tuna was so good, it was like the master made it himself. I don't think there was much toro on the menu, I think they saved that part for themselves! There was no distinction or choice available in the cuts but it was all good nonetheless.